His new manager no longer pays him to attend meetings, even when they are outside of his shift or on his day off. His wife asks if the new policy is legal. DEAR CARRIE: My husband works as a supervisor for a local utility on Long Island. For years whenever he had to attend a staff meeting, he would go in to work early or stay late and get paid to attend the meetings. He was paid straight time. His new manager, in an effort to stop paying the supervisors, has made the meetings mandatory and requires supervisors to attend or call in on their own time -- even on their days off. We’ve checked the company’s human-resource section on its website and cannot find anything related to this so-called requirement. Is this policy legal or has this manager gone beyond her authority? I don’t want my husband to get into trouble at work, but I believe he needs to speak up. He and his co-workers are afraid to contact human resources about the issue because they fear reprisals from the manager. Should they go to human resources anyway? -- Whose Time? DEAR WHOSE: Whether your husband has to be paid for attending the meetings depends on his status. If he is an hourly worker, in other words nonexempt, he must be paid for all the time he works and that includes meetings. The only exceptions to the rule are gatherings that meet all four of these criteria outlined in a U.S. Labor Department fact sheet on the topic: They are held outside of normal hours; they are voluntary; they are unrelated to the job, and company tasks aren't performed. Clearly the meetings your husband has to attend aren't voluntary. So if he is hourly, he has to be paid for that time and must be paid overtime if the extra hours mean he works more than 40 hours a week. On the other hand, if he is a manager, he wouldn't have to be paid for any extra time. A company can't declare someone a manager willy-nilly. That person has to manage at least two full-time employees and most of his or her work must involve managing, among other requirements. So your husband needs to clarify his status. And for that he should call the U.S. Labor Department at 516-338-1890 for more information. If it turns out he should be paid for attending the mandatory meetings, then armed with that information, he should talk to the manager. If that doesn't work, he should go to human resources and make his case politely, but firmly. 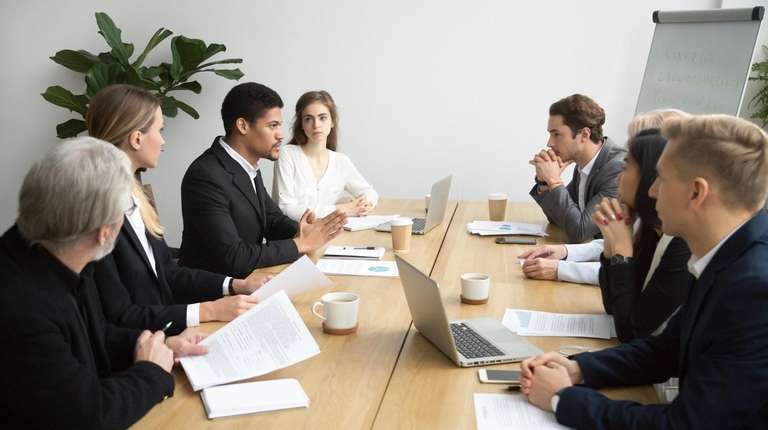 Of course, the new manager could have prevented the frustration your husband and his colleagues feel by giving them the legal reason why the meeting time can be considered unpaid, if that is the case. That might have gone a long way in allaying their concerns. DEAR VACATION: This is what state labor law says on the topic: "Every employer shall notify his employees in writing or by publicly posting the employer's policy on sick leave, vacation, personal leave, holidays and hours." It doesn't say "prospective employees," but "employees." In other words, employers have to advise "employees" ahead of time of the company vacation policy. And it seems that happened with your friend. Now, that may not sound fair. But it sounds legal. Go to bit.ly/HourlyLI for more on what are considered hours worked under federal labor laws.